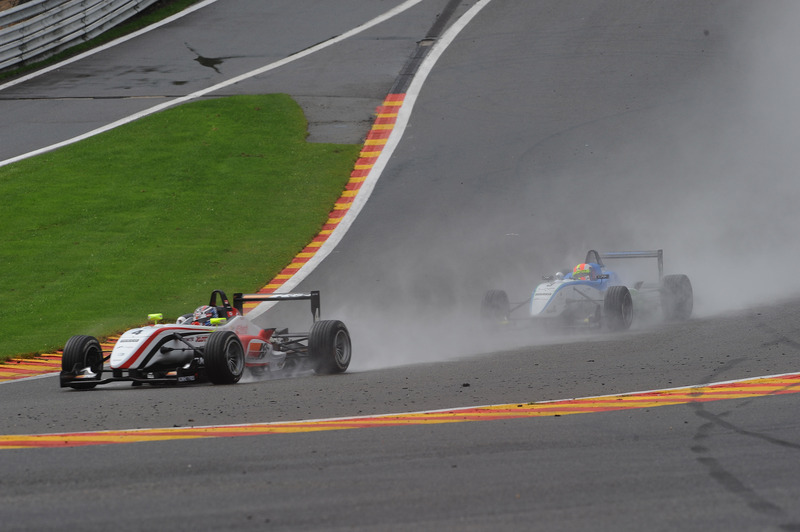 06/08/2011 - Michael Lewis obtained the victory in race 1 of the fourth round of the Italian Formula 3 Championship at Spa-Francorchamps (Belgium) at the end of a spectacular duel ended at the chequered flag. The Californian driving for Prema Powerteam, after the pole position, obtained therefore his first win in the category keeping at bay all attacks moved by the French Maxime Jousse (BVM-Target), that was constantly in the spray cloud constituting Lewis' slipstream. Third step of an all-rookies podium for Raffaele Marciello (Prema Powerteam) who lost the second position gained in qualifying after an off track excursion in the initial metres of the race, but setting later on the fastest lap of the race during the second-last lap. Sergio Campana (BVM-Target) obtained a brilliant fourth place thanks to a sprint start, while Kevin Giovesi (Lucidi Motors) ended sixth after battling in the initial stages with his team mate Victor Guerin, with the latter slipping down in ninth at the back of Brandon Maisano (BVM-Target) and Eddie Cheever (Lucidi Motors), splendid eighth after starting in 11th position and with one hand still aching after the incident of qualifying. The American Lewis is currently leading the classification at 64 points and is followed by Campana, two points short, while Liberati gives away the leadership and is now at 58 points from the top as today he did not score points in consequence of an error in the initial stages that brought him the 14th final position. Race two is scheduled for tomorrow at 10.20 (GMT+2).